We started at the Polynesian Resort. Once parked, we made our way to the Tambu Lounge, located next to the very popular Ohana. The drink of choice here was the Lapu Lapu. 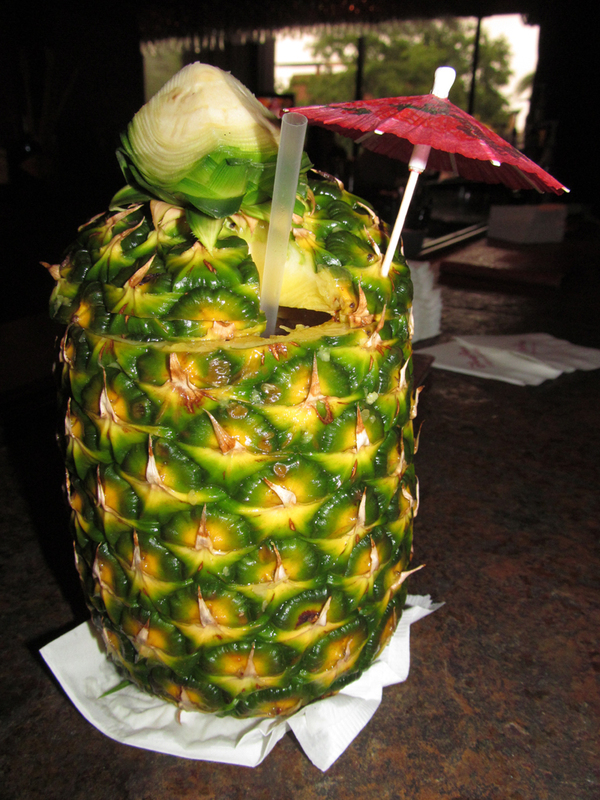 It was a stereotypical tropical drink served in a hollowed out pineapple, complete with paper umbrella. After Tambu Lounge, we headed to the monorail station and took the ride to the Grand Floridian. The destination here was called Mizner's Lounge. Located right off the huge atrium that makes up the hotel's lobby, the big thrill here was the free bowls of nuts that were brought to every table. 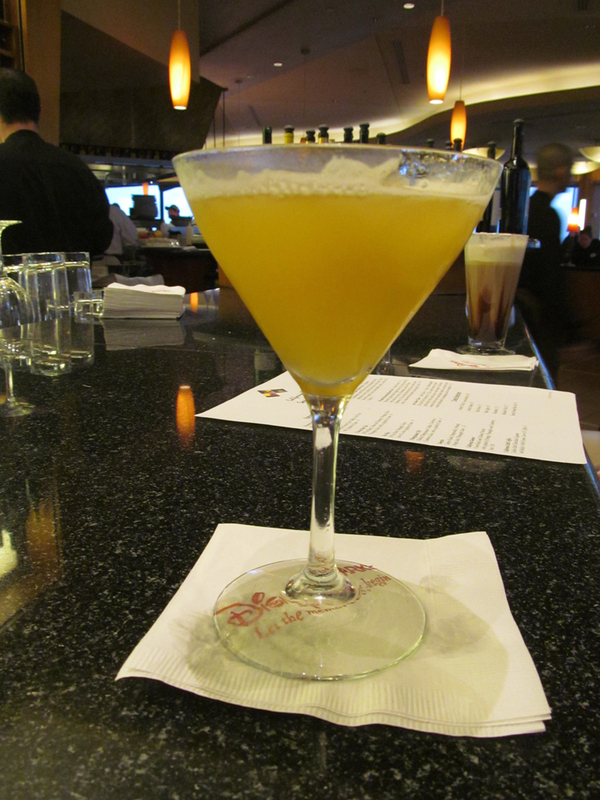 The drink of choice at Mizner's Lounge was the Glowtini. It was basically a martini with an added LED 'icecube.' This allowed you to drink your alcohol in any color you'd like by sticking your fingers in the martini and pressing the button on the cube. Once the light up martinis were finished at the Grand Floridian, we boarded the monorail once again and rode past the Magic Kingdom and into the Contemporary Resort. Here, we headed to the elevator that goes specifically up to the roof of the hotel to the California Grill. The California Grill normally requires reservations to eat at, but if you go to the desk downstairs and tell them you're going to the bar, they send you right up. Time it right and you'll be up on the roof of the hotel for the Magic Kingdom fireworks. Seeing them from above is my personal favorite way to watch Wishes. Here, the drink of choice is apparently called the Ray-Ray. As a food blogger, I had to get some food at California Grill. While the majority of the menu at California Grill is rather pricy, their flatbread pizzas are relatively affordable and are enough food for a meal. We ordered a Heirloom Tomato BLT Flatbread and were served the wrong one. Topped with beef, mushrooms, and greens, the heirloom tomatoes were nowhere to be found. They quickly corrected the mistake and brought out the Heirloom Tomato BLT. This thin flatbread was topped with marinated tomatoes, applewood smoked bacon, chiffonade romaine, and lemon mayonnaise. Getting a pizza topped with a range of colors from the typical to deep purple or yellow is very different. And very tasty. And that's my experience being a designated driver during a Monorail Bar Crawl. Watching people drink, eating flatbread pizzas at fancy restaurants, and riding monorails. I'd gladly do it again! I recently spent an afternoon in St. Augustine and had lunch at a restaurant along St. George Street called Florida Cracker Cafe. I ordered the Shrimp Po Boy. The sandwich came with two sides, and I picked collard greens and cheesy grits. The sandwich was good, with surprisingly large fried shrimp, lettuce, tomato, onion, and remoulade sauce. My general experience with shrimp po boys normally involves tiny shrimp, which isn't necessarily a bad thing since they are hidden away on a sandwich. The shrimp on this sandwich were quite large, almost taking up the width of the roll if angled correctly. I liked the sandwich, but the sides were disappointing. The cheesy grits were very plain tasting with very little cheesiness. The collards weren't much better, being so salty that I took a few bites and gave up. Florida Cracker Cafe had okay food. I liked my sandwich but the side items could definitely use some improvement. I did try their homemade potato chips which were another option for a side, and they were very tasty. Perhaps chips would be a better choice than grits or collards as a side if I return. It is time for a correction on this blog. Back in 2011, I ate at and wrote about a restaurant that I thought was called Captain J's Ocean Deck in Cocoa Beach. I was wrong. I actually ate next door to Captain J's at a place called Sandbar Sports Grill. On my most recent trip to Cocoa Beach, I realized the error of my ways when I actually ate at the real Captain J's Ocean Deck. I ended up at the Timacuan Country Club in Lake Mary and decided to get some food there. They had a make your own pasta station set up, so I figured that was the thing to go with. I had the chef make me a plate of penne with shrimp, scallops, peppers, onions, broccoli, and sundried tomatoes all in an alfredo sauce. I think I did a good job selecting items to go into the pasta and the chef did a good job cooking the food because I thought the meal was pretty tasty! For bread to go with the pasta, the country club offered popovers. This is not a typical type of bread to be served with pasta, but I do enjoy a good popover. They also had a salad bar set up that I tried, but I didn't take a picture. Overall, not bad for a golf course country club! I was invited to try Hot Krust Panini Kitchen for a Social Media Menu Tasting. Hot Krust is located in the Whole Foods shopping center at the intersection of Sand Lake and Turkey Lake Roads. Before trying any of the food, what initially impressed me was all meats are roasted fresh at the restaurant. Hot Krust doesn't use any processed meats or cold cuts in the sandwiches, unlike the majority of the other sandwich shops out there. When I arrived at Hot Krust, the meal started with two bowls of soup to try. The first was their soup of the day, a tomato cream soup (left). The second was Hot Krust's signature soup, their Chili Cactus Soup. It was made with cactus, ground beef, diced tomatos, onions, corn, northern beans, and spinach in a spicy broth. The soup had a flavor similar to a chili, but with a consistency more similar to most soups. It was very tasty and the uniqueness of adding cactus to the recipe made it even better. After the soup, I was able to try two of Hot Krust's sandwiches. The first was the Meat Lover's Paradise. This panini was filled with roasted chicken, turkey, freshly roasted steak, bacon, pesto, tomatoes, red onions, melted jack cheese, and chipotle ranch sauce. It was a good sandwich, but I personally found it to be somewhat of a meat overload. I also tried the Buffalo Bill Chicken Panini. This had freshly roasted chicken, buffalo sauce, onions, jalapeno peppers, lettuce, provolone cheese, and blue cheese crumbles. This was my favorite of the two sandwiches. Unlike other buffalo chicken sandwiches that I've had elsewhere, this one was actually nice and spicy. The jalapenos added a lot of flavor to the sandwich, and Hot Krust seemed very generous with the rest of the sandwich fillings as well. The sandwiches were served with waffle fries, although fries may not be the best word since these were baked rather than fried. If I wasn't told that these were baked, I honestly don't think I would have noticed that they weren't fried. I tried the sweet potato and regular potato fries, and I personally preferred the regular fries (I'm not a big fan of sweet potatoes). Hot Krust had some tasty sandwiches. The ingredients that they use seem to be good quality and they appear to care about their food. I'd gladly return to try some more of their paninis next time I'm in the area! I was recently in South Florida and stopped for food at Mauro's Pizza in Hollywood. Located downtown, Mauro's was a tiny pizza shop with a few tables outside of the restaurant. All of the tables were full when I walked in, which was a good sign that Mauro's had promising food. I ordered two cheese slices. For $2.75 each, the prices weren't bad and I can normally finish two slices with no problem. I wish I noticed the size of a slice on the way in though. The slices at Mauro's were humongous. Each slice was served on two full size paper plates, and the pizza took up pretty much all of the plates. They were equivalent in size, if not larger than the huge slices at Orlando's Lazy Moon. Only unlike Lazy Moon, the pizza here at Mauro's was actually very good! The crust was thin and crispy. The cheese was melted properly and was in good proportion to the tasty sauce. By the time I got through the first slice, I knew I'd have trouble finishing the second. After a bit of a battle, I did manage to get both of the slices down and thoroughly enjoyed them. There are so many Indian restaurants in the Central Florida area, and I've visited so few of them when compared to other types of foods. Recently, I was able to give one of these Indian restaurants a try when I stopped into Gateway to India in Longwood for lunch. Gateway to India is located along 434 in an old Pizza Hut building. They had a lunch buffet for $10.95, so I went with that. It seemed a little pricy for lunch, but still probably a better value than ordering from the menu. My buffet experience included two plates of food, filled with chicken masala, tandori chicken, various vegetarian dishes, naan, and rice. I enjoyed all of the food from Gateway to India's buffet. I've been to other Indian restaurants with larger buffets with lower prices for lunch, but the quality of food seemed substandard at some of these other restaurants. Here, the food seemed fresh and everything tasted good. I guess that's a plus of paying a few dollars more for a buffet! Lucky Dill was a NY Style deli during the day, serving typical deli-type foods like huge pastrami sandwiches. The breakfast menu included several different breakfast meals as well as omelets and sandwiches. I had a meal called the Manhattan Morning. This included two scrambled eggs, whole wheat toast, grits, and bacon for just under $5. The breakfast was simple yet good, and definitely much better than one of those pre-packaged breakfast wraps that are served at Starbucks!